Clean up an ugly stove by using just three common household ingredients. 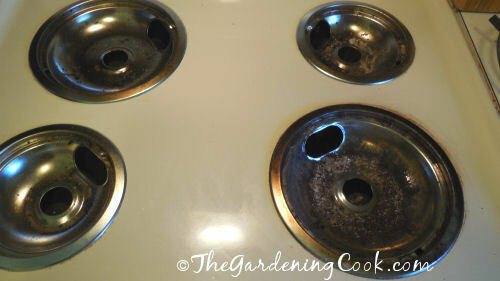 This drip pan cleaning works over night to give you sparkling burner pans easily without a lot of elbow grease. One of my pet peeves is seeing my electric stove drip pans and knowing I have to make a trip to the store and shell out $16 for four drip pans. The burner drip pans on your range can get really messy while you are cooking. No matter how often you watch items cooking on the stove, some do spill over. Once the spills burn onto the burner drips pans, you will have a challenging cleaning job ahead of you. 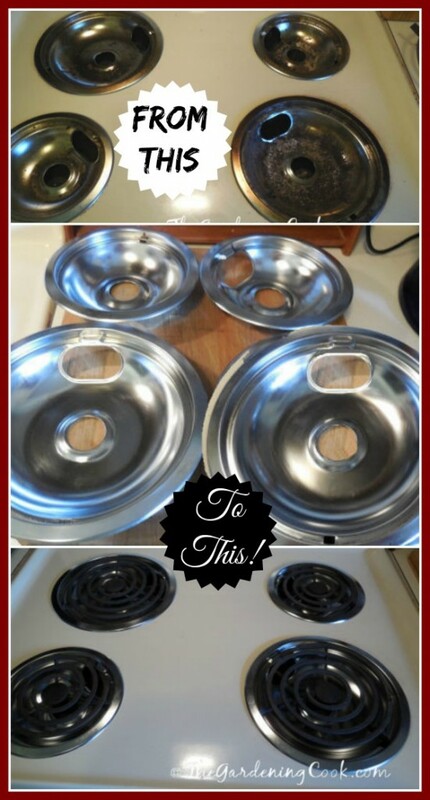 Cleaning stove drip pans in the past was a hit and miss project. I first cleaned them the best way I could but eventually, bit they would still look horrible and I’d have to pay for new ones. I had been doing this several times a year. Until today that is. I’ve heard about cleaning the stove drip pans with household ammonia but the fumes always got to me and I never could do it for long. The good news is that you don’t have to whip out any toxic chemicals! Here’s how to clean stove top drip pans with hyst a few common household items and a (little) bit of elbow grease. In no time at all, you’ll have sparkling burners pans with very little effort. The trick is to let the fumes work for you, not against you. And this takes a bit of time, so it is a project for when you won’t be cooking on the stove top for about a day. (You can do the same sort of process with your microwave and a lemon. Check out this tutorial for cleaning a microwave here. 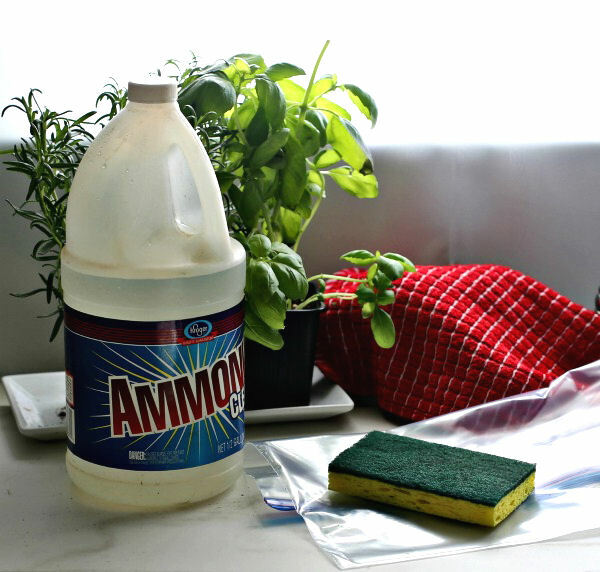 Household tips like this one are some of my most popular posts. See some more home and kitchen tips here. You are likely to have everything that you need for this drip pan cleaning project at home right now. All you need are three common household supplies. That’s right. 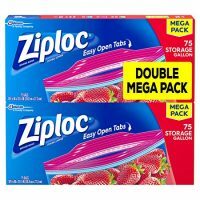 Some ammonia, a gallon zip lock bag for each drip pan and a Scotch bright sponge with a non stick pad on the back are all you need. If you do a lot of cooking like I do, your burners will probably look something like mine before I started. The drip pans were caked with spilled over water, oil and what not. They were a real mess! It’s easy to see which burners I use the most, isn’t it? I placed each of the burner drip pans in a large gallon plastic bag, and added 1/4 cup of ammonia to each bag, and then sealed the bag. I left them for about 24 hours. When I opened up the first bag, I was VERY disappointed. I thought there would be some overnight magic. Not a lot of difference, right? I almost tossed the stove burner pans in the trash can in disgust. But then I took the next step with my scotch bright pad and wiped over it. The dirtiest spots on the oven drip pans needed the scourer but not with any real elbow grease. The lighter spots just wiped off with the sponge and removed the grime. I was amazed. Totally amazing! I simply could not believe it. Three of the four cleaned up extremely easily with just some easy wiping and a few scrubs with the plastic sponge back. Why do some burners need more scrubbing? The worst one took a bit more scouring but it was still night and day compared to the work that I put into cleaning them on previous attempts using steel wool and a scouring cleanser. The reason the fourth burner drip pan was hard to clean was because the it had been previously cleaned with steel wool, so the surface had been damaged and gave the gunk a key to hold on to. I’ll probably replace it so that the ammonia will work more easily on it next time. My clean stove top after is like night and day from the before picture above. I know it is hard to believe, but try it and see for yourself. I will update this article once I have cleaned them a few times to see how easily it is after they’ve been cleaned several times. The ease with which they cleaned up makes me believe I may not be shelling out for new burner drip pans in future! Total cost to me was about $1.25. 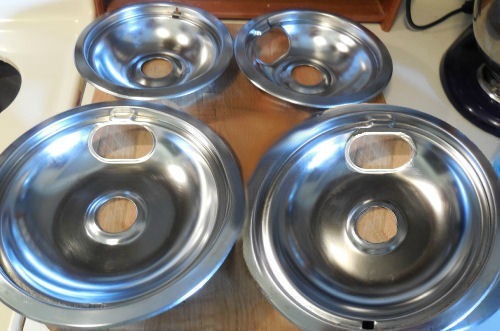 Far cry from $14 for four burner drip pans! These burners pans were new and had never been cleaned before. Subsequent cleaning worked okay but not as well as the first time especially in the drip area. If you use a metal scourer, it will leave grooves in the metal which will make subsequent cleaning far less effective. So my recommendation is to do the cleaning fairly often, and if they pans have been cleaned and scoured previously and are really dirty, it is time to get a new set, as this will not work well. But for the first cleaning on moderate dirt, even baked on, it worked just as I showed above. Would you like a reminder of this post for drip pan cleaning? Just pin this image to one of your Pinterest Household boards so that you can easily find it later. 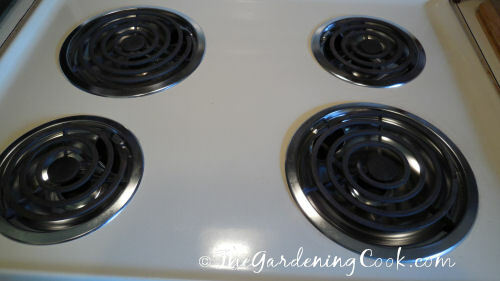 Admin note: This post for drip pan burner cleaning first appeared on the blog in July of 2014. I have updated the post to include some new photos, a printable project card and a video for you to enjoy. 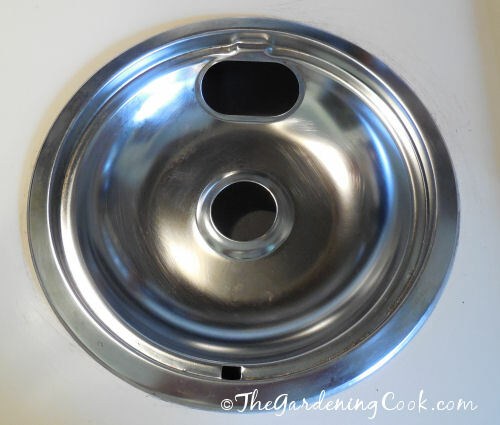 Clean your burner drip pans easily with just three household ingredients and a little bit of time. 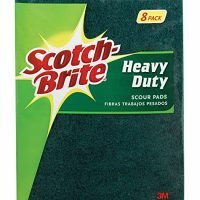 A Scotch brite sponge with a non stick pad on the back. Pour 1/4 cup of ammonia into each bag in the well of the drip pan. Use the Scotch brite pad to rub over the surface of the drip pans. 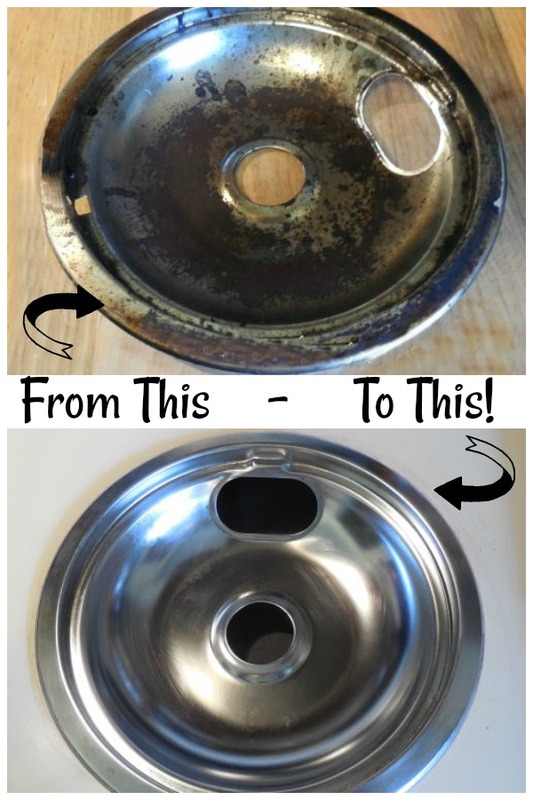 .This process works best with drip pans that have not been cleaned before. If you have used steel wool, this allows the gunk to build up more and is difficult to remove it. As long as you clean this way each time they need it, you will find that it continues to work although not as well as the first time.. The dirtier the pans are, the more you may need to scrub, so I would recommend doing this fairly often, so as not to get them too dirty. I normally don’t like using toxic chemicals, but I’m with you… I’d rather give it a try than to pay money for new ones every few months! Can u do this on black ones? This works on oven racks also. Put them in a black plastic garbage bag with ammonia, and place in the hot sun for a few hours. Gunk wipes right off! Just don’t let the rack pierce a hole in the bag. I usually put in on my driveway so when they’re done, I can open up the bag and rinse the ammonia away with a hose. Thanks for the info. I would love to know what the canisters with cats on them are used for! Very nice. I wonder were her pans aluminum? aluminum might react differently with the ammonia?? just a thought. If you only use 1/4 cup of ammonia then the pans are not submerged correct? Im wondering how it cleans them if there is barely any liquid in them? I had the same issue Angi! I had to buy new pans. I wonder if it was just the brand of pan? Angi and Crystal had ALUMINUM drip pans. Your tip is one I have used for over 30 years on chrome or stainless steel as I owned a professional cleaning service. I too am frugal & don’t want to shell out $15 for a cheaply made aluminum drip pan. Typically I soak mine in highly consented soapy water then scrub like a mad woman. So I was super excited to try this new method. Maybe I missed a crucial step but this didn’t seem to make a big difference. Very little crud came off even with tenacious scrubbing. And I let the pans soak over 24 hours. The instructions seemed simple enough. Any suggestions? 2. On second use, if the junk is caked on, it does not work as well. 3. On second use, it works if the junk is moderately on. The inner drip area was the problem for me this time. I have white enamel drip pans and this method worked great! I previously spent a lot of time scrubbing them. I have to soak one again but very little crust is left on it. I scrubbed mine with Barkeepers Friend and a scrubber. It is made of rhubarb powder and does not scratch. It is the only way I could get mine clean. I have been known to cover them with aluminum foil as my landlord only replaces them at most once a year. Hi, this sounds very easy I just want to know how much ammonia and can you put the actual burner and the drip pan in the bag? I’ve used amonia succeessfully in the past. My ques is, how do I get the pans out of the range? My old range had a slot on the back of the pan, so they lifted right out. The new pans don’t have that slot. Hi Betty. I am not familiar with all types or ranges. Perhaps your owners manual will give you some help on this question. 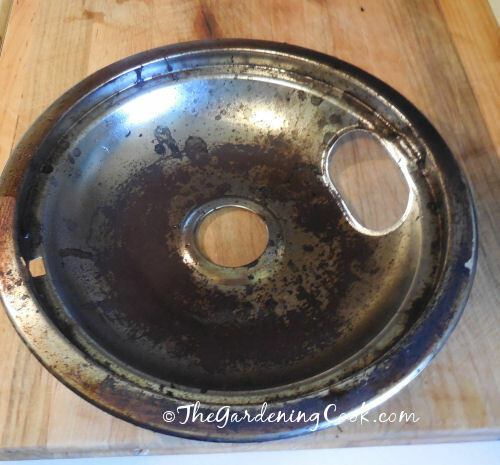 I am currently cleaning up a vintage stove I just purchased and I am going to try this on the original drip pans cause they are baaaaad! Fingers crossed I will let ya know! 🙂 thanks for the tip! than scrubbing till my fingertips hurt.